When: February 6th - 4 pm until ? Where: O'Doherty's - Spokane Fall Blvd and just east of Howard. NARRATIVE: This evening, February 4th, at 2109 hours, the Spokane Fire Department dispatched a total of 6 fire apparatus and 2 chief officers to a reported structure fire located at 5933 N. Atlantic. Engine 18 from Fire Station 18, arrived on the scene a little over 4 minutes after being dispatched. Lt. Pat Sanders reported that he had a single story tri-plex with smoke showing from the center unit. He and his crew advanced a pre-connected hose line into the fire unit and extinguished a fire in the kitchen. Other fire crews verified that occupants in the adjoining apartment units were safely outside and assisted in ventilating the fire unit. Engine 18 had the fire under control within 5 minutes of their arrival. The fire was confined to the apartment of origin and the cause was cooking related. 22 Firefighters responded to this incident. There were no reported injuries. DAMAGE EXTENT: Apartment kitchen area. Smoke damage throughout the entire unit. Engine 3 stopped, blocked rush hour traffic and then pushed this lady's Suburban off of Maple St, back in November. 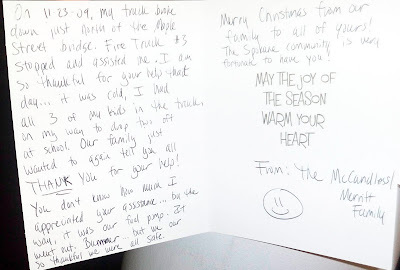 In December, she sent us this really nice note. It is a slow news day, so I thought I would share this. Most of the time, you never find out how things turn out after we help somebody on a regular call, let alone just helping someone you come upon while returning to the station. So it was really neat to hear from her and find out what caused her vehicle and her family to be stranded in the middle of a busy arterial. If you ever get any notes like this, send them my way and we'll post them. On 11 -- 23 -- 09, my truck broke down just north of the Maple Street Bridge. Fire Truck #3 stopped and assisted me. I am so thankful for your help that day... It was cold, I had all three of my kids in the truck, on my way to drop two off at school. Our family just wanted to again tell you all thank you for your help! You don't know how much I appreciated your assistance... By the way, it was our fuel pump. It went out. Bummer... But we are so thankful we were all safe. Merry Christmas from our family to all of yours! The Spokane community is very fortunate to have you! NARRATIVE: On Feb 2, at 1406 hours, the Spokane Fire Department responded 4 engines, 1 ladder, 1 pumper-ladder, 1 rescue, and 2 battalion chiefs to a reported structure fire at 2518 E 5th Ave. The first arriving company, SE7, reported smoke issuing from basement vents and from the front door. After confirming that all occupants were out, companies began a coordinated attack on the basement fire and quickly extinguished it. There were no injuries to civilians or firefighters. PROBABLE CAUSE: The cause is under investigation by the Special Investigative Unit and no cause has been determined at the time of the media release. DAMAGE EXTENT: Heat damage was confined to bedroom contents with moderate smoke damage throughout the rest of the structure. No, not the usual Borg Bashing that many have enjoyed over the years, but an actual gathering and celebration of Greg's many years of service to Local 29. Where: O'Doherty's - Downtown Spokane. Here. Every union gathering we have had at O'Doherty's has been a very good time. So come on down and raise a pint, eat some good food and share some stories.